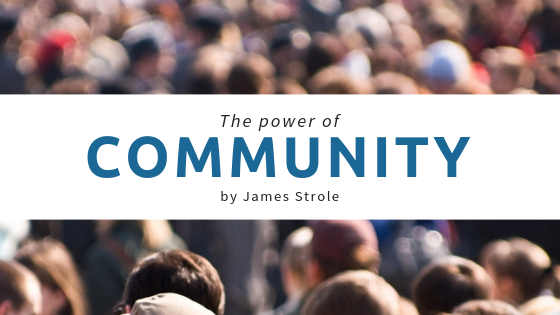 James Strole, Co-Founder of People Unlimited, talks about the power of community. “If you want to go fast, go alone; if you want to go far, go together". In my work as Co-Founder of People Unlimited over the years, I have found this adage to be very true. I see more than ever today the vital need for community in extending and raising the quality of life and the quantity of life. The basis of physical immortality is appreciating the ultimate value of human life. Since every human being is unique, if we let ourselves die, no-one else will ever come along to replace us. As Co-Founder of People Unlimited I have made it a priority to provide a community where people can come together to embrace and celebrate differences, instead of discriminating against each other. Human beings need connection, stimulation and intimacy with each other. The sharing of joy and inspiration together, as well as important scientific information, makes life richer and more interesting for all of us that participate in People Unlimited. I am convinced that no-one will be able, or even want to, live forever without excitement and the society of like minded people. Since no human being that we know of so far has conquered death or radically extended their life, it seems clear that the answers to this challenge are not in the past. So we need to look ahead through science and futurism to find the solutions we need, and that means connecting with more people who feel the way we do about living. The stimulation of collaborating with others and generating more creativity together will help us feel more alive. It also brings us closer to the breakthrough scientific advances that are going to take us to the future. In my work as Co-Founder of People Unlimited, I have seen that the stresses of living are just too much on individuals trying to make it by themselves. We need the support of other positive people when it comes to embracing life extension modalities and making them work for us. RAADfest was created in this spirit of cooperation. I realized, as Co-Founder of People Unlimited, that we needed to reach out more and bring together as many like-minded individuals as possible to energize the global life extension community. Events such as RAADfest are vital for sharing the wealth of new information, the cutting-edge scientific advances in age reversal, as well as the expansion of mindset to include the possibility of ending death altogether. Raising awareness globally will also help attract more resources and investment dollars to bring about our life extension community initiatives more quickly. One of my goals as Co-Founder of People Unlimited is to let people know that we are now in a new era where it is possible for us to begin to reverse aging. But I also know that if we are serious about doing this we will have to form a stronger community to support each other to make it happen. Together we can energize each other to not only have a great vision, but to take real action in our lives to manifest this great reality.